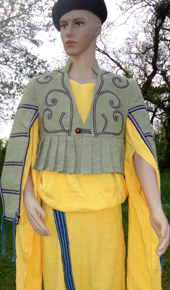 The Gaelic Ionar (pronounced "inner") is worn over the Léine and is usually made of stout wool. 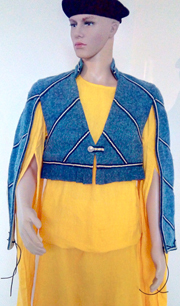 It is made very short compared to modern jackets. 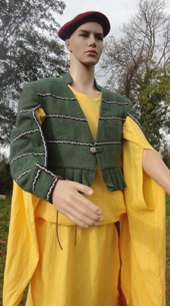 The sleeves are opened on the inside which is done to allow the sleeves of the Léine to hang free. The Ionar is often, though not always, elaboratedly decorated. The most common type of decoration consisted of contrasting coloured strips in a series of lines. Another common decoratative form contained flowers, vines and swirls. 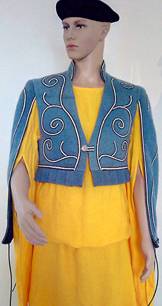 Some basic Celtic designs may also have been incorporated. Orders for Pipe-bands and individuals can be taken, Contact Us for details. - For the latest Postage and Packaging costs to your destination Contact Us. Please note that colours may slightly vary due to your monitor/computer callibrations.